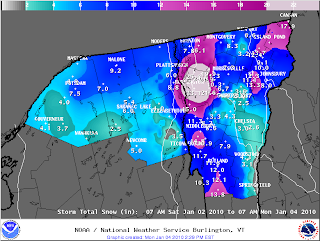 The heavy snowstorm which affected northern New England over the weekend put Burlington, VT directly in the bullseye. The National Weather Service reported on Monday that the storm total of 33.1" at Burlington International Airport set a new all-time snowfall record for a single storm. The old record was 29.8" in December 1969. Other storm totals around the northeastern New York/Vermont region are listed below. A daily snowfall record was also set at Caribou, ME for January 2 (8.5" vs. 5.8" in 1972).